‘”The world is full of poetry. The air is living with its spirit; and the waves dance to the music of its melodies, and sparkle in its brightness”, said the American poet James Gates Percival about poetry, which is called the music of the soul. Robert Frost put it more subtly- “Poetry is when an emotion has found its thought and the thought has found words”. Indeed, such has been the effect of poetic verses that one transcends from the harsh realities of life into an enlightened otherworldliness. 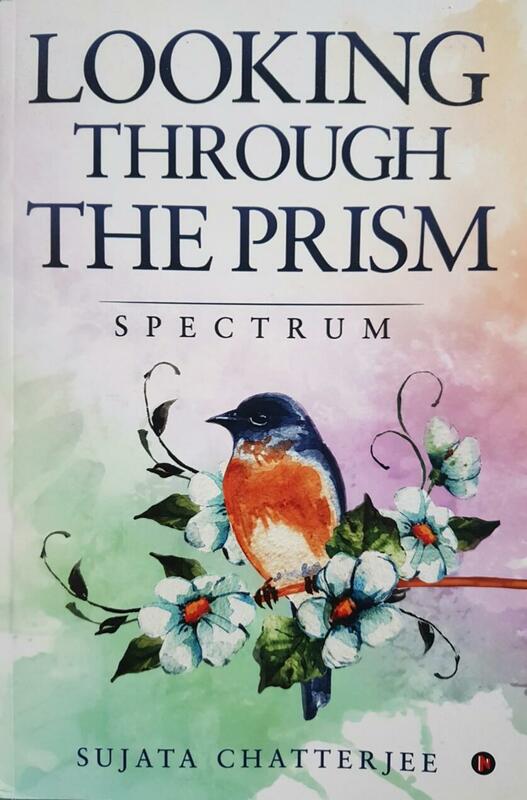 The author Sujata Chatterjee comes up with her book “Looking through the prism: Spectrum” which is a collection of poems with a positive outlook towards life. The book cover is colourful and bright- with vibrant pastel hues of blue, green, purple and brown- which gives a subtle delicateness to the front cover and sets a positive mood for the reader, who gets the feeling that something magnificent waits for him/her in the book. The cover shows a multi-coloured bird sitting on a branch with blossoming flowers and greenish leaves and tendrils. Also, the author has compared life and nature in her poetry, and for this very simple reason the book cover is very apt. The blurb on the back cover also explains the essence of the poems very well. The book contains a collection of 17 poems on varied themes. The poems are written very well with lyrical rhyming schemes, which ups the soothing effect and also makes them more apt for verse singing. The lines from the poem “Every kind of a little thing” go like this- “Raindrops on roses and dewdrops on leaves; The crimson robe that the scarlet sun weaves” which explains the lucidity and sprightly attributes of the verses. The best poems of the collection are “Every kind of a little thing”, “A Rainbow”, “Come O Spring”, “Newer Horizons”, and “The Forgotten Cottage”. Also, readers will relish the fact that many diverse themes have been brought together in the enlivening poems which makes this collection stand out. Drawings and sketches also accompany each poem which lends them a visually appealing character. The frequent rhetoric in the poems is one that embraces optimism and inspiration. Also, nature is a frequent visitor in these poems with many of them written solely on nature, with many-splendoured descriptions of beautiful valleys, lively hills, scarlet suns, sparkling dewdrops and vivacious flowers. This is a book of inspiriting poesies that elates the mood of the reader with its percipient verses. That it also takes the reader for an introspective ride and galvanises one to ponder about the various ills and shortcomings that plague the present world we live in; but being optimistic also shows us the positive side of this increasingly fragmented world is even more heartening. This book is an invigorating collection of disparate poems that revitalizes the reader to the core and uplifts the poetic sensibilities in a subtle manner.